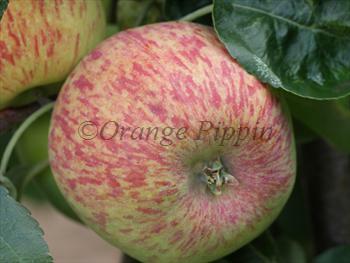 Duchess of Oldenburg is a popular early-season apple, primarily used as a cooking apple although it can be eaten fresh when fully ripe. It is often known simply as "Duchess". It is easy to grow, and therefore a good choice if you are looking for apples to cook with in early August. The key to its success in the kitchen is its tart acidic flavor which holds up well in cooking. Slices usually lose their shape during cooking, making Duchess of Oldenburg best suited for recipes that require apple sauce. Fill in the details below and we will let you know when Duchess of Oldenburg apple trees are back in stock. Duchess of Oldenburg is a reliable variety, easy to grow, and very winter-hardy. Originated in Russia in the early 18th century. Introduced to the USA via the UK in the early 19th century.